Yesterday I visited many wonderful sites on Orkney - the Stones of Stenness, the Ring of Brodgar, the Brough of Birsay and Skara Brae as well as a working watermill and a beautiful manor house with secret doors in the library that looked like the perfect setting for a murder mystery. I took so many photos that I haven't had a chance to go through them yet. I will do - and write about them on my blog - but here are just a couple to start with. 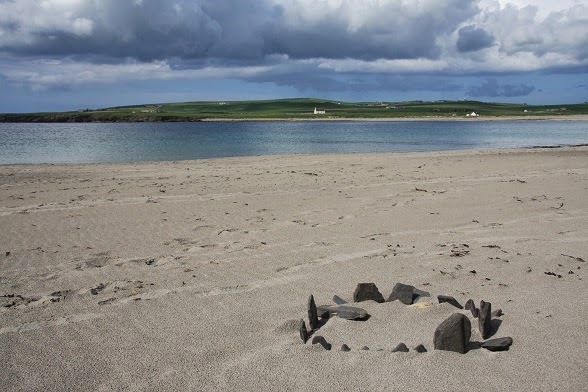 Rather than being Neolithic megaliths, they show mini stone monuments made not so long ago that are on the beach below Skara Brae. 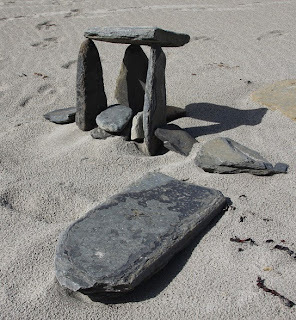 I thought they were lovely, although I have no idea who built them or why. Your pictures of this trip are so inspiring! I've been to Scotland, but missed a lot of this stuff. There's SO much to see there.